Latest British Retail Consortium (BRC) and KPMG figures show UK online sales have risen year-on-year by 10.9% in February 2013. The increases are up a percentage point on February 2012’s 9.9% year-on-year change. The six month average year-on-year percentage change was at 10.8% and for 12 months it stood at 11.1%. 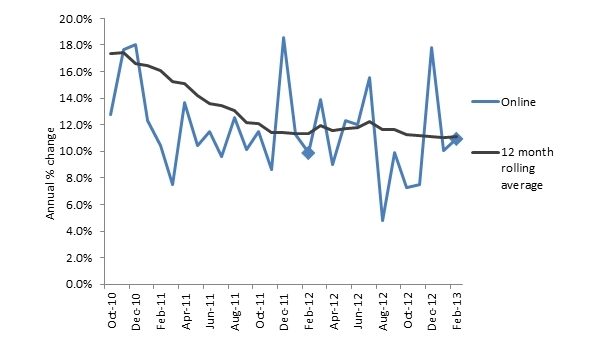 The BRC averages are weighted by the number of weeks (four to four and half) in a monthly trading period. KPMG and the BRC report that Health and Beauty was the standout performer thanks to solid Valentine’s Day sales and strong promotional activity. Robust clothing sales were also inspired by consumer indulgence in end-of-season clearances. Director general of the British Retail Consortium, Helen Dickinson, revealed health and beauty benefited from Valentine’s day too. “Health and beauty was another strong category, boosted by a Valentine’s rush for gifts, fragrances and cosmetics.” she said. Click-and-collect was fared well for multichannel retailers. The BRC reports that the convenience of picking a purchase up at a more suitable time appeared vital for many. The findings also confirmed mobile’s fast growth from a small base. Dickinson summed up the UK’s online sales as being fairly sturdy for the period. “Online sales growth had another solid showing, broadly in line with the previous month and the annual average,” she said.